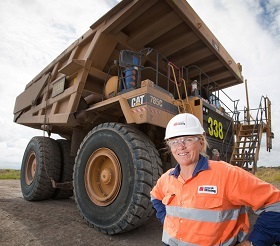 60 per cent of women in mining don’t report discrimination for fear their claims will not be taken seriously by their male superior, according to new research just released. The report, by Beyond Recruitment Group, also found that 70% of the blue-collar female workers surveyed had routinely experienced discrimination while working on a mine site. A very different result was seen among the women employed in white-collar positions. 30% of the women surveyed were white-collar workers who said they had never experienced gender based discrimination and that reports of discrimination would be taken very seriously. One participant of the anonymous survey described the discrimination as part of a mining culture. “Based on my experiences working on remote mining sites there is little respect for women in blue-collar positions by their male counterparts, mining has its own culture and when you are on site there are unspoken differentials in performance standards,” she said. Beyond Recruitment Group CEO, Mike Postle, said while the results were shocking they only depicted a very small minority of mining operations. “We have recruited many women for both blue-collar and white-collar positions in the mining industry and have received strong positive feedback both from those women and their employers. Beyond Recruitment Manager for Mining and Energy, Liam O’Toole, said there has been a strong increase in the recruitment of women in the mining industry. “Whilst there are continued challenges facing women within the mining and resources sector, we have experienced an increased interest by the organisations we work with to focus particular attention on the recruitment of women across their operations,” said Mr O’Toole. “Having placed many females in both blue and white collar positions, a positive turnaround is evident, in that our clients are continuously exploring more effective ways in which to improve diversity through both their recruitment and employment conditions,” he said.